GAZA CITY, Palestinian Territories, May 27, 2018 (BSS/AFP) - Israeli tank fire at an Islamic Jihad observation post killed two Palestinians in the southern Gaza Strip on Sunday, the enclave's health ministry and sources from the militant movement said. The ministry identified those killed as Hussein al-Amour, 25, and Abdul Haleem al-Naqa, 28. 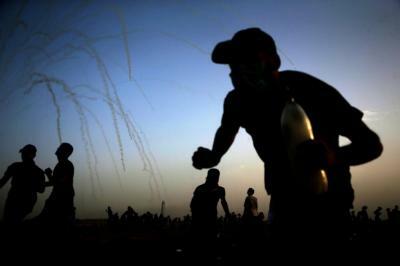 The incident happened east of the city of Rafah in the southern Gaza Strip, a ministry spokesman said. Israel's military said in a statement that the tank fire came after soldiers detonated an explosive device that had been placed near the border fence, targeting its troops. Separately on Saturday night, Israeli aircraft struck two targets belonging to Islamist movement Hamas, which runs the Gaza Strip, but there were no reports of casualties. The military said the operation was in response to a brief incursion across the border earlier in the day by Palestinians who immediately fled back into Gaza. It added that the strike was also in retaliation for repeated Palestinian attempts to damage the border fence and "security infrastructure" during ongoing border protests. At least 118 Palestinians have been killed by Israeli fire in the Gaza Strip since mass protests and clashes broke out on March 30, according to figures from the Gazan health ministry. No Israelis have been killed during that time. Low-level demonstrations along the border have continued since protests peaked on May 14, when at least 61 Palestinians died as tens of thousands of Gazans protested the US moving its embassy from Tel Aviv to Jerusalem. It accuses Hamas, with whom it has fought three wars since 2008, of seeking to use the protests as cover to carry out violence.